Since this month is all about SPOOKY READS, I decided I needed to try and find something that was really going to make me think twice about sleeping with the lights off. But like horror movies, this task can be hit-or-miss for me. I’m looking for something scary, something I can read at night that has me inching closer and closer to the middle of the bed and paying more attention to whether or not I let my foot inch out of the covers while I sleep. Something creepy that stays with me throughout the following day, careful to keep my eye on the darker corners of the house and constantly telling myself to, “CHILL OUT, it’s just a story!” THAT kind of book. And I think London Clarke did an excellent job bringing those emotions to life for me. 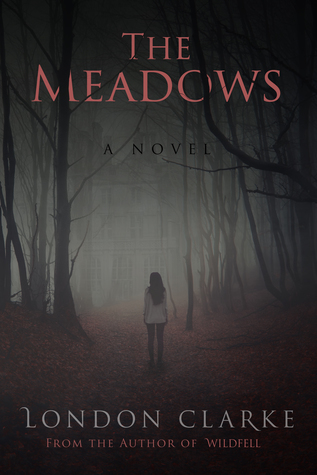 The Meadows is about a woman who buys an old mansion, far away from her troubled city life, in hopes of making it into a bed and breakfast. The people in town keep hinting that something isn’t right with her new business venture, the mansion may have a dark history (as most old mansion do), and weird stuff is happening on the property she has put A LOT of money into. But this isn’t your run of the mill old ghost story. You see, she is also dealing with the possibility that there are flesh and blood human beings who welcome the chilling events that take place on this expansive property. And being new to town, it’s impossible to know who you can trust. Scarlett doesn’t believe in ghosts, nor does she entertain the thought that what happens in the house can’t be logically explained. Is she right, or is she in for a very rude awakening? She is also a recovering addict who has lived in the world of blackouts and hallucinations, so strange things usually follow a glass (of three) of wine. The plot itself may not seem the most original to the more seasoned horror reader out there, but it does certainly take you on a paranormal journey that muddies the lines between rumor and fact. I found that the discoveries of new evidence builds in the most delicious way, and makes the end of the book really come together the way a good read should. After reading, I can also appreciate the time and effort the author put into researching the parts of the story that come from the real world. I will say there were a couple things that didn’t sit well with me in terms of the story. First, I wasn’t feeling the romance element. I didn’t detect any real chemistry and felt that it didn’t ADD anything to what was going on. I prefer my horror to be filled to the brim with things I don’t see coming and crazy, paranormal events that seem like they could happen in the real world. I don’t need a romance thrown in there unless it actually strengthens the plot. I would also have enjoyed more exploration of the grounds, maybe more of a backstory with the original owner and why exactly he named the house as he did. I think the author could’ve taken this a bit further, giving our paranormal entities more depth in personality and origin. But as I said at the beginning of this review: the book is still worth giving a read, especially if you are obsessed with the horror genre. There is a lot of originality to this book, on top of the traditional ghost story elements that we appreciate. There is a second book that follows The Meadows and I am curious to see what the author does with it. Will we get more into the origins of Asphodel House? Will there be more deadly consequences for those who step foot inside? I can’t wait to find out. If you’ve read this book or are planning to read it, tell me what you thought! Will you read book two? Thank you for reading! Enjoy the rest of your #booktober!